A week ago we went to the apple farm and came back with nearly 20 pounds of apples. I’m not even remotely kidding. I’m in apple heaven. I love this time of year. Sure you can get apples year round but they’re not local and super fresh. In fact, the apples that are shipped in sometimes taste funny which really bums me out. I wish apples could be frozen like other fruit and enjoyed year round. Boy would that save me some frustration and sadness in the off season! Maybe someday someone will come up with a solution outside of canning applesauce or apple pie filling. Neither is the same as a fresh juicy apple. 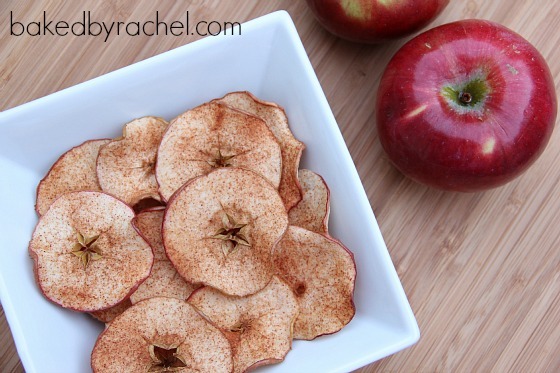 Homemade baked cinnamon apple chips are a simple and delicious snack the entire family will love! Every year I get super excited to make my favorite apple pie. Last year I made it easily three or more times and one of them may or may not have been completely for my own consumption. It’s that good. I have every intention of making it at least once this year but I wanted to come up with other ideas to make with my supply of apples. Brainstorming possibilities and flipping through recipes I knew what had to be made. Ever since Cheri of Kitchen Simplicity shared her recipe for maple walnut apple chips, I’ve been dying to make some of my own. Instead of making maple chips this time, I went a basic route as a test run. 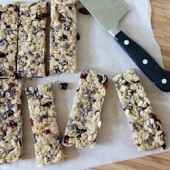 Not only were they simple and delicious, they were also a huge hit with the kids! The recipe itself takes maybe 5-10 minutes max of prep work depending on how fast you go and an hour to three, in my case, of bake time. 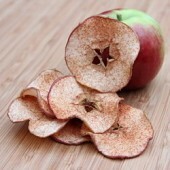 You could just as easily dry the apple slices out in a dehydrator if you happen to have one. *I found using a sharp knife worked easier than a mandoline as the cheapo one I had was not wide enough to accommodate my massive apples. Also, bake time will vary greatly depending on the thickness of your slices. Check once every hour until the apples are nearly crisp and no longer moist. 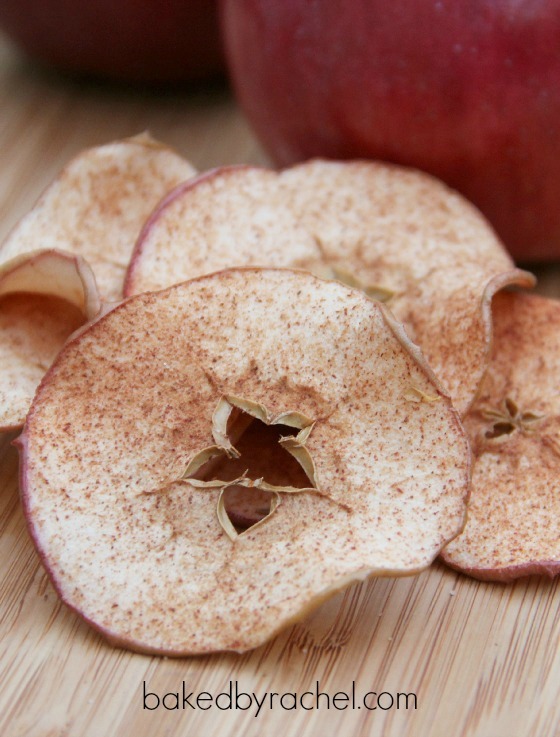 Thin slices of apples sprinkled with cinnamon and sugar, then baked until crisp. A simple and delicious snack. Using a mandoline or a sharp knife, carefully cut apples into very thin slices. Discard any seeds. Arrange on a baking sheet prepared with parchment paper. Do not overlap apple slices. Preheat oven to 200°F degrees. Mix cinnamon and sugar together in a small bowl. 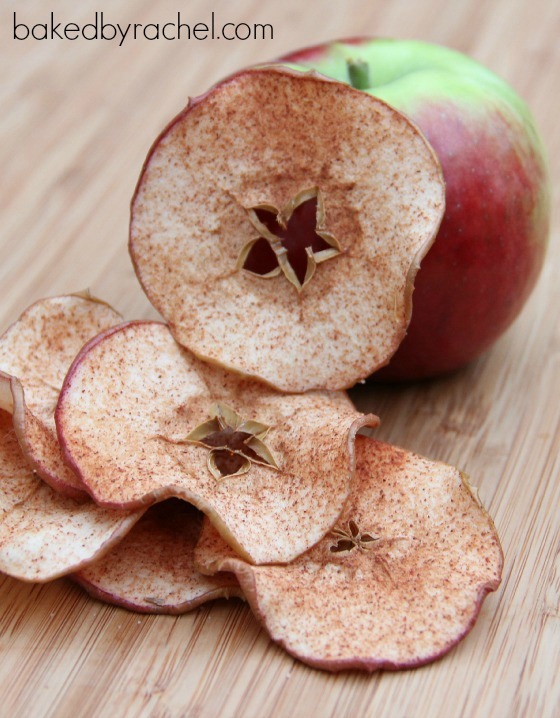 Sprinkle cinnamon sugar mixture over apples. Bake for 1 hour. Using tongs, gently lift apple slices to release from parchment paper. Return to oven to bake for another 1-2 hours or until no longer moist. Hi! 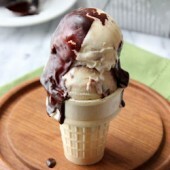 I am baking these now and have a question. When you say to “release them from parchment paper” after baking one hour, does that mean I remove the apples, discard the parchment paper, and then put the apple slices back on the bare cookie tin to continue baking? Thank you for clarifying! Releasing them simply means to unstick them. By doing this, they’ll be easier to remove at the end of the cook time. Continue cooking them on the parchment until completely dry.